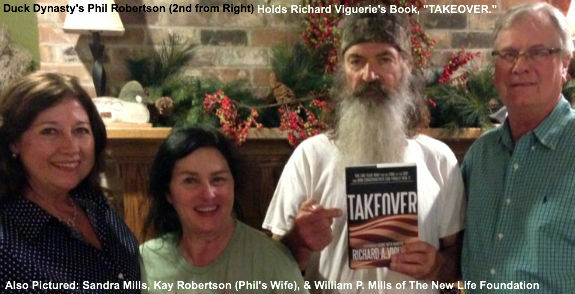 What Does Phil Robertson Know About The GOP That You Don't? Duck Dynasty's Phil Robertson and ConservativeHQ chairman and author Richard Viguerie agree: the Republican Party needs to return to a focus on the Founders' principles, including Christianity, to improve and start winning where it counts. According to Politico, Robertson’s speech focused on religion in politics, citing quotes from the Bible, referencing prayers written by John Adams and George Washington and reading religious legislation, such as a 1983 Senate and House resolution designating the year as the national year of the Bible. Among other notable conservatives who recommend Takeover are radio talk show host and constitutional law expert Mark Levin. Levin even added TAKEOVER to his required reading list saying “Richard Viguerie has a great new book out; go get this book." Viguerie appeared on Levin’s show May 12, 2013, to talk about TAKEOVER and how limited government constitutional conservatives can use the plan in the book to take over the Republican Party and govern America according to conservative principles by 2017. To read what others are saying about TAKEOVER go to Mark Levin’s Facebook page. Go HERE to purchase your copy of TAKEOVER and receive a free copy of “The Law that Governs Government” by Richard A. Viguerie and constitutional lawyer Mark J. Fitzgibbons.